Outreach engages with local community organizations, labor unions, faith leaders, immigration groups and health justice workers, and others to address broader needs in the Boston area. What does that mean in practice? It means we spend a lot of time going to meetings, meeting new people, starting conversations, organizing actions, and engaging with the wide and diverse landscape of social justice organizing in Boston. If you work with an organization or group and are trying to figure out how OB might fit in -- or if you're new to Occupy Boston and want help connecting with the right working group -- we're probably a good place to start! STREET TEAMS is the action wing of outreach, and plans on-the-street actions, canvassing, community rallies, street theater and other projects (frequently in conjunction with outreach and other working groups). Currently this group meetings Thursday at E5 - join the mailing list for updated information. There are lots of ways to participate. Every conversation you have about Occupy is Outreach! Here are some suggestions; please add your own. Make your 99% status visible: carry a sign, make yourself a tee shirt or pin. Look for opportunities to bring up Occupy. Don't be afraid to tell people what you really did over the weekend! If you've ever worried about money or politics, you're one of us. It's true that we don't have a set list of goals. We do know that the system is broken, and we want as many voices as we can to contribute so we can fix it together. What do you think will help? The best way to help with on-site volunteering is to just SHOW UP. People AT the camp ARE the occupation. Look for people who are working and ask how to help. Ask a camper if you can help with anything. Camping is the hardest part of this occupation. For campers to stay, they need to be comfortable. Check in at the WELCOME CENTER. There is a list of volunteer needs. Remember to dress for the weather. Being outside generally requires warm clothes and comfortable shoes, because of the gravel path. Learn about Occupy through this wiki and www.occupy.org. Basic information that might be helpful in understanding and explaining Occupy Boston is available at Occupy 101. Get a card table and set it up downtown somewhere. Or at a busy bus or train station. Wherever there’s a lot of foot traffic. Print out a bunch of flyers from http://occupyboston.com/flyers-print-and-post/ And just go sit at the table and answer questions. The first time will be hard because you’ll be learning at the same time you’re answering questions. But it’ll get easier. Print out the FAQ from the website and bring them with you. Make sure to check the FAQ sometimes, because there are updates as we figure out other stuff people want to know. 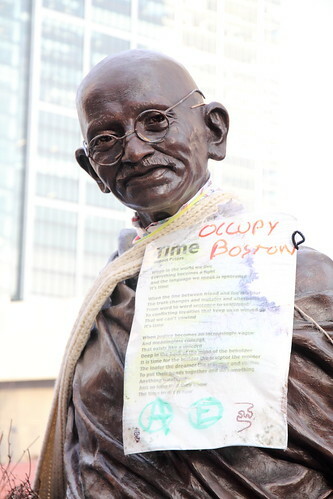 Follow the Occupy Boston Twitter (@Occupy_Boston) stream and the news about Occupy Boston. Then tell the world about it! The more people who know about us the better. See also the [Street Theater] Direct Action Working Groups for lists of ideas for group action. Read the Minutes and Agendas of Past Meetings. This page was last modified on 8 June 2012, at 10:38.